"DPS, Gandhinagar believes in keeping each child in the pink of her/his health." It focuses on the overall well-being of each child. The school has a dedicated infirmary managed and manned by a highly qualified doctor / caretaker (Nurse) assisted by an experienced nurse. Each student has a separate Medical Card issued by the Infirmary which is to be filled by the parents. 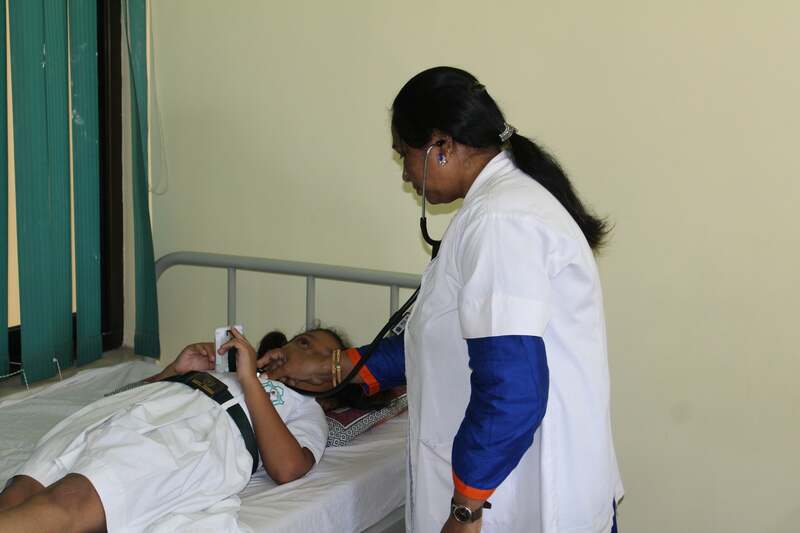 The regular checkups of the students are carried out at the infirmary and health camps are organized by the school for comprehensive checkups of the students by medical practitioners specialized in different arenas of medical sciences. Ambulance is kept ready in case of medical emergency. The parents are informed about any medical issue with their wards that demand immediate attention. Any Child who is not well at school visits Infirmary with an Almanac after informing / due permission from the teacher in the class. The Nurse put a stamp in the Almanac authenticating child’s medication/ case at Infirmary. Parents are informed about child's sickness through Almanac. Have adequate sleep of at least 8 hours. Immunize their children as per the doctor's advice. Not send children suffering from communicable/infectious diseases like conjunctivitis, chicken pox, measles, influenza, mumps etc. to school till the prescribed period of abstinence is over. Produce a doctor's certificate permitting the child to attend school after recovering from an infectious or contagious disease. Inform the school authorities in writing if the child is suffering from a chronic disease stating the history of illness and special precautions to be taken if any. The procedure school follows if a child becomes sick and doesn't need to visit the hospital, is to put him/her in school Sick Bay with proper treatment. The school has a well-equipped medical room and a qualified attendant to provide first-aid to a child in case of need. A comprehensive annual medical check up of each child is done by qualified doctors to monitor the child's physical growth.